"Focus, Moving Ways - OBI Box Set - 7 Minis"
FOCUS - MOVING WAYS - Japanese OBI MINI REPLICA LP TITLES making a 7 CD Box Set- Japanese OBI MINI REPLICA BOX SET Japanese re-mastered Mini LP replica Limited Edition Collection Recorded from the finest Original Masters available. Each title Comes with anti-static sleeves similar to Vinyl LPs, Cardboard packaging exact to the original LP, Re-sealable plastic wrap cases for protection of each collectible and includes extensive Liner Notes Booklet. Actual miniaturized version of the 12" LP in 4" CD version Special VERY RARE LIMITED EDITION BOX SET ONLY PRODUCED ON FUTURES FOR THIS ONE TIME PRESSING -- were only available in Japan. 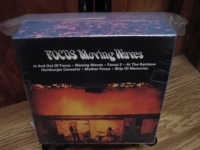 THE FOCUS SET - MOVING WAYS INCLUDES - First-pressing-only 7 CD box set containing paper-sleeve editions of 7 FOCUS ALBUMS. Titles include - MOVING WAYS - FOCUS 3 - HAMBURGER CONCERTO - SHIP OF MEMORIES - MOTHER FOCUS - IN AND OUT OF FOCUS & AT THE RAINBOW IN AND OUT OF FOCUS - Track Listings 1. Focus [Vocal Version] 2. Black Beauty 3. Sugar Island 4. Anonymus 5. House of the King 6. Happy Nightmare (Mescaline) 7. Why Dream 8. Focus [Instrumental] MOTHER FOCUS - Track Listings 1. Mother Focus 2. I Need a Bathroom 3. Bennie Helder 4. Soft Vanilla 5. Hard Vanilla 6. Tropic Bird 7. Focus IV 8. Someone's Crying... What! 9. All Together... Oh That! 10. No Hang Ups 11. My Sweetheart 12. Father Bach SHIP OF MEMORIES - Track Listings 1. P's March 2. Can't Believe My Eyes 3. Focus V 4. Out of Vesuvius 5. Glider 6. Red Sky at Night 7. Spoke the Lord Creator 8. Crackers 9. Ship of Memories MOVING WAYS - Track Listings 1. Hocus Pocus 2. Clochard 3. Janis 4. Moving Waves 5. Focus II 6. Eruption: Orfeus/Answer/Orfeus/Answer/Pupilla/Tommy/Pupilla/Answer/The 7. Answer (Eruption) 8. Orfeus (Eruption) 9. Answer (Eruption) 10. Pupilla (Eruption) 11. Tommy (Eruption) 12. Pupilla (Eruption) 13. Answer (Eruption) 14. Bridge (Eruption) 15. Break 16. Euridice (Eruption) 17. Dayglow (Euruption) 18. Endless Road (Eruption) 19. Answer (Eruption) 20. Orfeus (Eruption) 21. Euridice (Eruption) LIVE AT THE RAINBOW - Track Listings 1. Focus III 2. Answers? Questions! Questions? Answers! 3. Focus II 4. Eruption/Orfeus/Answer/Orfeus/Answer/Pupilla/Tommy/Pupilla 5. Hocus Pocus 6. Sylvia 7. Hocus Pocus (Reprise) FOCUS 3 - Track Listings 1. Round Goes the Gossip 2. Love Remembered 3. Sylvia 4. Carnival Fugue 5. Focus III 6. Answers? Questions! Questions? Answers! 7. Elspeth of Nottingham 8. Anonymus Two HAMBURGER CONCERTO - Track Listings 1. Delitiae Musicae 2. Harem Scarem 3. Cathedrale de Strasbourg 4. Birth 5. Hamburger Concert: Starter/Rare/Medium I/Medium II/Well Done/One ... 6. Early Birth 7. Hamburger Concerto: Medium I 8. Hamburger Concerto: Medium II 9. Hamburger Concerto: Well Done 10. Hamburger Concerto: One for the Road 11. Early Birth These are Japanese digitally re-mastered Mini LP replica CDs (the OBI Edition). This Limited Edition Collection has only VERY FEW made world-wide and are immediately Out of Print. Recorded from the finest Original Masters available. Comes with anti-static sleeves similar to Vinyl LPs, Cardboard packaging like an LP, includes extensive Liner Notes Booklet. Actual miniaturized version of the 12inch LP in 4inch CD version.